When the most important people in your life live many miles away, you have to become creative in how to stay in touch with each others’ lives. 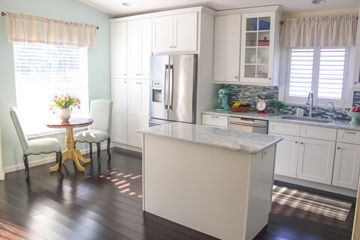 When I got married and moved from New York to Florida, I was adamantly determined to do everything in my power to stay close to my parents and siblings, no matter what. Even though we were miles apart, we could still stay close in our hearts:). Yeah, maybe it sounds cheesy, but I’m a girl and when girls talk about their families, they have an excuse to be sentimental, melodramatic and corny for good measure. My worst fear when I moved was becoming the long distance relative that everyone saw only a few times a year and who didn’t REALLY know everyone or what was going on in their lives. Technology certainly came to the rescue. I talk with my parents and siblings almost every day thanks to our cell phones, Face Talk, Skype, text messages and the internet. We have all become especially proficient in group messages. It’s not unusual to come back to my phone after leaving it unattended to find 30 messages waiting for me on regular days and sometimes even 80 messages on special occasions. It’s an incredible way to stay in touch and be in sync with the major pillars of everyone’s lives, such as who’s getting married, having babies or where they live, work and go to church. However, everyone knows that you can’t have an intimate relationship with such impersonal information. Group messages give us a chance to peek into each other’s everyday lives, the mundane, seemingly insignificant things that we do every day, but these are the building blocks of who we are. 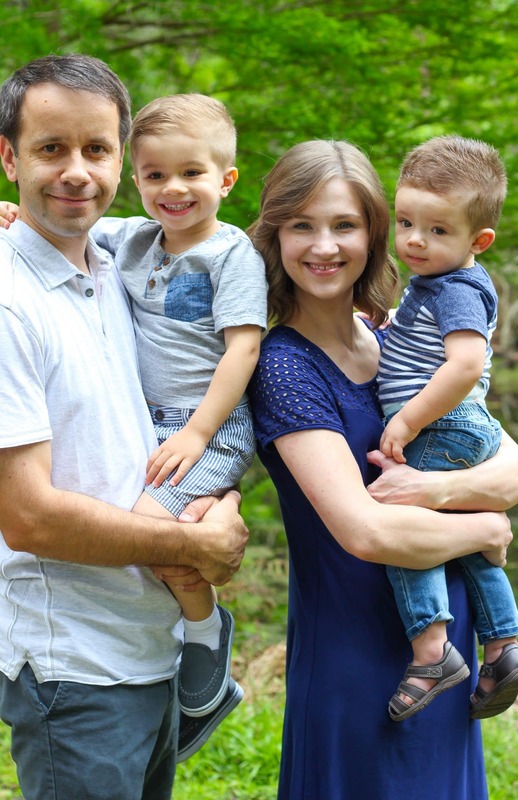 When we do see each other in person, it feels like we haven’t really been apart all that long, because we saw the pictures of our cute nieces in my sister’s living room coloring, or helping their mom bake in the kitchen, we saw the new car that my sister and her husband purchased. We join in the step by step process of my brother and his wife’s nursery decorating as they wait for their daughter to arrive and my other brother and his wife’s new dining room table, my parent’s cheery tree in bloom, the first snow, and them having fun with their granddaughters. It’s absolutely wonderful to share everything with each other like this. We even share what we’re eating every once in a while. 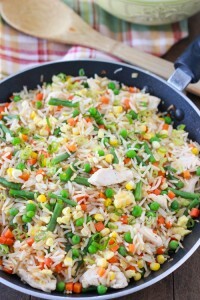 Last week, my sister, Elina, sent us all a picture text of her Chicken Fried Rice. It looked mouthwateringly delicious and I was craving it before I put the phone down. Everyone else seemed to agree and before you know it, this week many of us were enjoying rice for dinner. This recipe turned out to be phenomenal, so I took pictures and wrote down the recipe to share with all of you too. Stay in touch with the people you love. It’s important. It’s best to use cold cooked rice for this recipe. 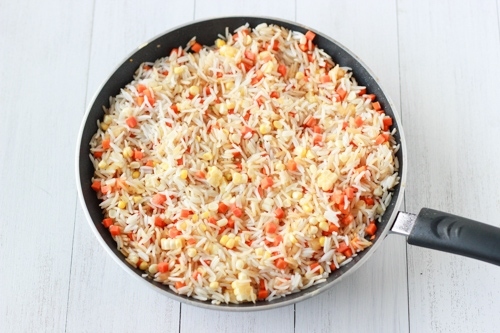 If you don’t have any cooked rice on hand, cook 1 cup of rice, and spread it out on a rimmed baking sheet to cool it. You will need 3 1/2-4 cups of cooked rice. Cut the chicken into small pieces, season with salt and pepper. Heat 1/2 a Tablespoon of oil in a nonstick skillet on medium high heat and cook the chicken until it’s no longer pink. Set the chicken aside. 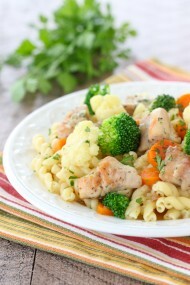 You can make this dish vegetarian by simply omitting the chicken. You can also use shrimp instead of the chicken. Season the shrimp with salt and pepper, and cook it on high heat for just a minute on each side and set the shrimp aside as well, and add it to the rice at the very end. 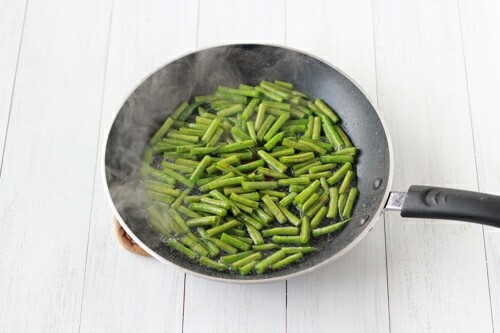 Add the green beans to the same skillet, season with salt and pepper, pour in about 1/4 cup of water, cover the skillet and cook until the green beans are tender but still vibrant green. Set them aside as well. 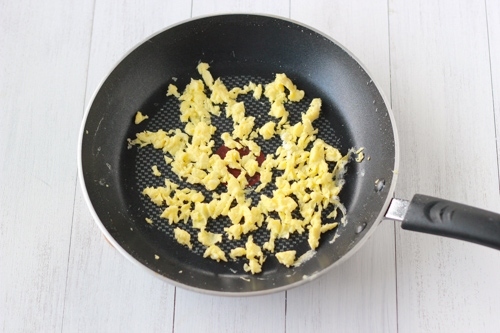 Add one teaspoon of oil into the skillet and scramble the egg. Set it aside. 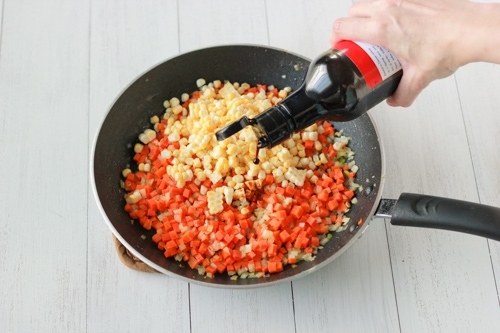 Add 1 Tablespoon of oil into the same skillet and add the onion, carrot and garlic. Season with salt and pepper and cook, covered, until the vegetables are softened, about 5 minutes. Add the corn, rice and soy sauce. Mix to combine. Add the cooked chicken, green beans, egg, peas and mix to combine. If you use a 9-10 inch skillet, it will be filled all the way to the top, just like you see here. 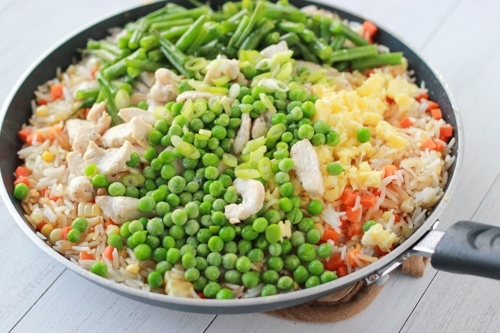 Use a 12 inch skillet if you have one, or mix all the ingredients in a large mixing bowl at the very end before serving. Either way will work. Cook for about 2 minutes, just until everything gets heated through. Garnish with green onion. It's best to use cold cooked rice for this recipe. If you don't have any cooked rice on hand, cook 1 cup of rice, and spread it out on a rimmed baking sheet to cool it. You will need 3½-4 cups of cooked rice. Cut the chicken into small pieces, season with salt and pepper. 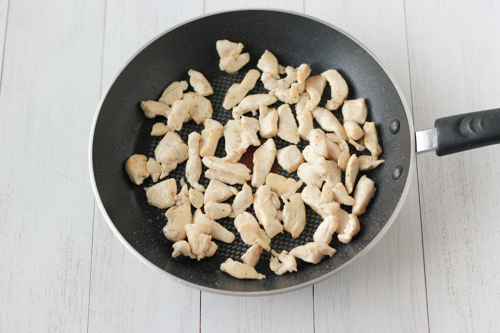 Heat ½ a Tablespoon of oil in a nonstick skillet on medium high heat and cook the chicken until it's no longer pink. Set the chicken aside. Add the green beans to the same skillet, season with salt and pepper, pour in about ¼ cup of water, cover the skillet and cook until the green beans are tender but still vibrant green. Set them aside as well. Add one teaspoon of oil into the skillet and scramble the egg. Set it aside. 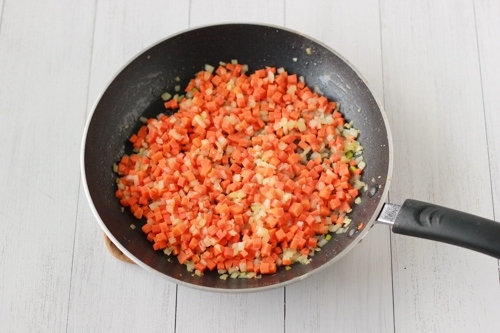 Add 1 Tablespoon of oil into the same skillet and add the onion, carrot and garlic. Season with salt and pepper and cook, covered, until the vegetables are softened, about 5 minutes. Add the corn, rice and soy sauce. Mix to combine. Add the cooked chicken, green beans, egg, peas and mix to combine. Cook for about 2 minutes, just until everything gets heated through. If you use a 9-10 inch skillet, it will be filled all the way to the top, just like you see here. Use a 12 inch skillet if you have one, or mix all the ingredients in a large mixing bowl at the very end before serving. Either way will work. Garnish with green onion. 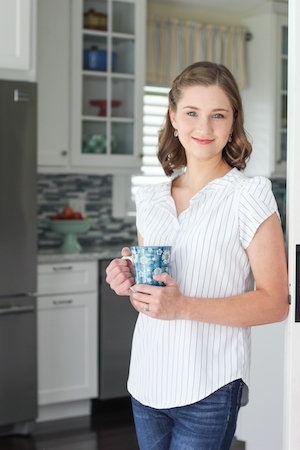 Can I use canned corn? Of course you can, Irina, however, they won’t be crunchy. what kind of rice are you using? 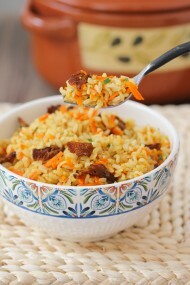 I’m using basmati rice, but you can use any kind of rice, as long as it’s already cooked and cooled. I try to be as specific as I can in the ingredient list and the recipe instructions, unless it doesn’t matter in the recipe. I know that if I wrote 1 cup of basmati rice, I would get comments asking if they could use jasmine, brown, or other rice. In this recipe, the type of rice is not important. Hi olga! This is a great recipe….I want to make it. But instead of adding chicken we will have grilled chicken….What king of side dish would you recommend? Grilled chicken will be fine too. As for the side dish, you can serve anything you like. It’s a very versatile dish. Any kind of salad, roasted, sautéed or pickled vegetables, etc. Just made this for dinner tonight & loved it! 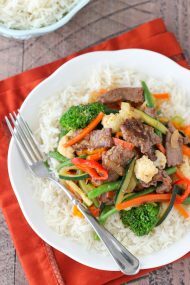 It’s a healthier stir fry take out for sure!! Very impressed with the outcome. I used ham and followed everything else exactly. Will definitely be making this again! It’s SO much healthier than take out! Ham sounds like a great addition too. Thanks for taking the time to write, Yana. Thank you for taking the time to comment, Nata! I’m so happy to hear that you enjoyed the Chicken Fried Rice. Thanks for visiting my blog:). Made this dish yesterday (with my 13 y/o daughter, as i’m teaching her how to cook). I’m so thanksful for this blog and the easy to follow steps, which makes cooking process such a blast and fun, even for kids! I used a packaged mix of frozen: corn, carrots, peas & green beens, and also fresh green beens, since i had them – everything else was exactly done as its written in the recipe, turned out awesome!!! I’m so happy to hear that, Oksana. I’m always thrilled to hear of parents teaching their children to cook. You are creating so many memories with your daughter. I loved cooking with my mom. Hi Olga, thank you for the recipe. It turned out really good. That’s great, Ella! You’re welcome. Do you think this dish would freeze well? 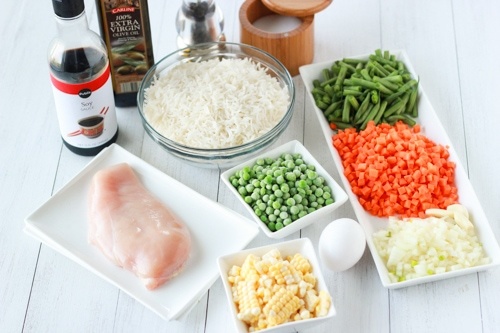 Yes, it will definitely freeze well, although if you use chicken breast, it will become dry and rubbery when reheated, so I would recommend using chicken thighs.